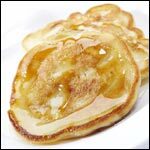 This recipe for Pancakes was submitted by CurbingCarbs on 2/10/2004. 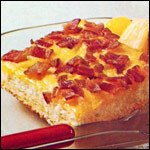 Click here to view the recipe. Very good. Best low carb pancake recipe I've tried to date. I have made a similar pancake but I do not add the butter or oil, use cream cheese instead of cottage cheese (1 egg per 1 ounce of cream cheese), no cream, 2 packets of splenda and a dash of vanilla extract. YUMMY!!!! The pancakes are okay... the topping you chose to use makes a big difference. Okay, they're yummy!! However, use caution. I calculated the calories after I'd consumed the whole batch (because it says one serving) and it's a whopping 934 calories. And I only used 1 tablespoon of oil. Plan your day accordingly if you're going to use this recipe. 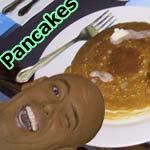 Just tried these pancakes this morning. "Awesome" is to say the least. One of the best flaxseed meal recipes I've tried to date. I have made these for the last year and think they are wonderful! I put fresh blueberries on them once they are on the griddle and everyone loves them! A little cinnamon in there is great as well! I love the nuttiness of the flax but the texture was off for me, I think it was all the fats. These are excellent. Love them. Oh. Dear. God. These were the NASIEST things I have ever eaten. I love flax seed. I'm loving my new low carb lifestyle. But these piles of disgustingness are so far beyond anything I can even attempt to describe. I am still new to the low-carb diet and this was my first go round with flax seed pancakes. I don't really know what I was expecting the to taste like. They were more egg tasting than pancake tasting. I made a strawberry and cream cheese spread to go on top and that helped. For a recipe with no sugar they were fine. I think I might keep looking for a different recipe. The instructions were easy to follow and they turned out better than any pancakes I ever made before. I always mixed them too much. With these, you want no lumps! I don't know if I did something wrong, or if you guys have no sense of taste.... but these were disgusting! Followed the directions except used the ricotta instead of cottage cheese like dr. lit said since I didn't have the cottage cheese and ricotta has fewer carbs and it was probably one of the worst things I've ever eaten... I couldn't finish even 1 pancake. Since I have plenty of all of the ingredients I'll probably try one more time hoping I just didn't cook them right but not expecting much better. These pancakes were so good! Now all I need is some sugar free syrup and it will be perfect. I almost felt guilty eating these because they taste so much like high carb pancakes. But it's great to know that my blood sugars won't shoot up after eating these. I'm definitely going to make these for the whole family! I used 1/2 flax seed and 1/2 whole wheat. If you're not into the total carb thing,but want low carb these were delicious. I topped with ricotta mixed with sweetener, a dash vanilla and enough buttermilk to make it smooth. Drizzled low carb syrup... yum. We love it. I substitute an equal measure of ricotta for the cottage cheese -- it's smoother and I think has a slightly better taste. 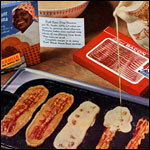 Two tablespoons of water helps it stay reasonably liquid so it spreads out a little better on the griddle. CARBS = 4.5 (1.5 for the eggs, 2 for the ricotta, and 1 for the cream. No carbs in the oil, baking powder or flaxseed meal). Really loved this recipe-satisfied my craving for pancakes. Recipe is not 13 carbs though-much less than that in fact. 2 carbs for eggs, 1.5 carbs for heavy cream and 1.5 carbs for cottage cheese = 5 carbs for the entire recipe! Really tasty, and I recommend. Well I am fairly new to the low carb thing... and I found these bloody awful. Maybe we did something wrong, but it turned out to be more like scrambled eggs gone wrong. And as for the flax seed flavour... I think I will go try the Pork Rind pancakes instead. If you use fat-free all natural ricotta or even full-fat ricotta (both have 1g carb/2oz - I get mine from wholefoods) then this is extremely carb and very Atkins friendly. Hi I just made the pancakes I used the ground flaxseed w/blueberrys i found in Traider Joes I did not use the cottage cheese and I cut the recipe in half it was real good! I had some sugar free syrup in the fridge I happened to look at the carbs aaaaah 11grams for a 1/4 cup not low in carbs! gos to show you allways have to check the lables! Great recipe! Used whole milk ricotta instead of cottage cheese & heavy whipping cream. Recipe made 8 - 3" dollar size pancakes. Each pancake approx. 110 cal, 4g Protein, 2g Fiber, .6g NET Carb. 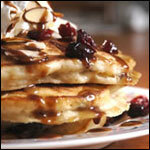 According to RDA each pancake is 8% of recommended daily allowance of fiber. Note: try to cook all the batter at once as flax will absorb the liquid and thicken if allowed to sit. Where are you guys getting these carb counts for these pancakes? cottage cheese is 4-7 carbs...1/2 n 1/2 is 1 carb and flax is 4 carbs... 4 fiber = no carbs. I make my own version of flax pancakes every few days, cottage cheese free because thats kinda nasty, regardless if you used all of the ingredients listed, these pancakes are still less than 10 carbs. remove the creamer and the curds and they are no carbs at all. Nice recipe! I love finding new ways to incorporate flax seed into different foods. If you're looking for flax seed, check out flax-seed-fish-oil.com. Whoever wrote this recipe ("CurbingCarbs") is not dealing with a full deck... in other words.... You're cheating your readers... shame on you! Anyone can use the term "roughly," however, the actual carb count on these pancakes is "ROUGHLY"... 20 carbs, not 13! Try including all the carbs per item! Tsk! Tsk! I'm sure you'll agree 7 more carbs is death to a carb counting individual who may be on Atkins... shame on you! Thanks! Lela and I are interested in any recipe we can put our ground flax into. If you're looking for ground flax seed check out FlaxSeedPro.Com. These were pretty good....definately cured my pancake craving... didn't add the cottage cheese... it turned out good anyway.